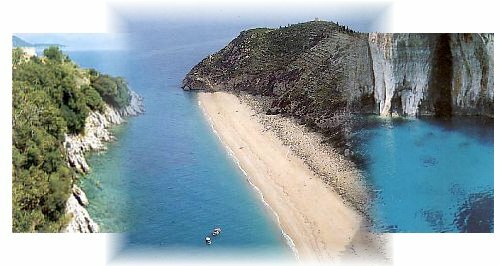 Vacation in Ionian, is a complete guide to the Greek Ionian (eptanissa) islands and a hotel reservation system. In our pages you will find info for each island as well as a complete list of hotels with full description and rates for all budgets and tastes. In just two steps you will be at your destination. Start your search now and enjoy your journey. Press Ctrl+D to Bookmark this page. If you are a hotel owner in Greece and wish to enter this catalogue, please click here and find out the details. The Ionian islands are both geographically and culturally a mixture of Greece and Italy. Floating on the haze of the Adriatic, their green silhouettes come as a shock to those more used to the stark outlines of the Aegean. The islands were the Homeric realm of Odysseus and here alone of all modern Greek territory, except for Lefkada, the Ottomans never held sway. After the fall of Byzantium, possession passed to the Venetians until its collapse in 1797. Most of the population must have remained immune to the establishment of Italian as the official language and the arrival of Roman Catholicism, but Venetian influence remains evident and beautiful despite a series of earthquakes. It is the heavy rainfall that makes the Ionians among the greenest of Greek island chains. Apart from tourism, olive groves and vineyards still play a role in the economy. The tourist resorts are crowded throughout the high season, but the richly varied countryside and abundant beaches draw large numbers of travelers year round, with the spring being a particular favorite for the lush greenery and wildflowers. Tourism has hit Corfu in a big way ­ so much so that it's the only island besides Crete known to locals and foreigners by different names. None of the other islands has endured anything like Corfu's scale of development, although the process seems well advanced on parts of Zakynthos.